This guest reflection is by ELGL member and NRC Marketing Manager Angelica Wedell. “OPEN” is a four-letter-word, but one that local governments today need no longer avoid. 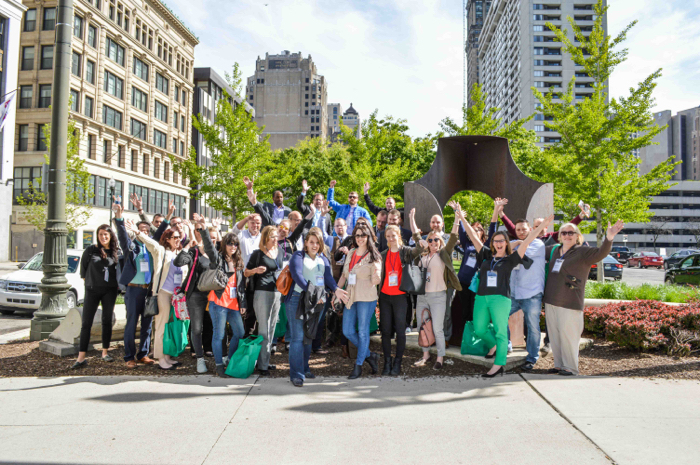 Making the profession more accessible is a major talking point for ELGL (Engaging Local Government Leaders), and was a recurring motif at the recent conference in Detroit. Keynote speakers asserted that open government is just as much about civic engagement as it is career opportunity. James Anderson of Bloomberg Philanthropies said government has traditionally feared openness “because it’s about power and sharing.” But if we are to build better communities, governments must embrace accessibility. “We have to create a track record of trust,” Anderson said. Accessible government demands communication, a core tenet of ELGL that members fully buy into. So conference attendees took to social media. They tweeted favorite quotes from presentations, posted pictures of their adventures in Detroit and shared lessons learned with their communities at home and online. By the end of day one, #ELGL17 was already the top trending hashtag in Michigan. “[#ELGL17] potentially reached more than 1.3 million Twitter users,” tweeted the Social Media Analytics Command Center the following week. Open Government, Accessibility, Transparency, Opportunity, Engagement – whatever you want to call it – is something ELGL local government employees, students and followers recognize as integral to the job. They see the implications for their communities and their own careers. I see local government from a National Research Center, Inc. (NRC) vantage point. We are a survey research firm that provides data to help local leaders move their communities forward. So standing on a roof-top in Detroit, looking over what many are calling “the Comeback City,” I couldn’t help but ask the professionals and thought-leaders beside me how we can make local government more accessible. – Morgan Adams, Survey Associate for National Research Center, Inc.